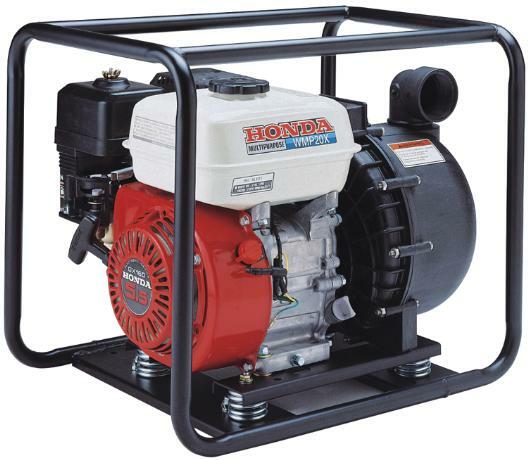 The Honda WMP20X Multi-Purpose Water Pump is designed to pump agricultural and industrial chemicals without damage to the pump housing like a standard aluminum housing pump. The Honda WMP20 also utilizes EPDM seals that are chemical resistant. The applications for use as approved and recommended by Honda are as follows: Acetic Acid, 20 %, Aluminum Sulfate, Ammonium Nitrate, Ammonium Sulfate, Barium Sulfate, Borax (Sodium Borate), Calcium Chloride, Citric Acid, Copper Sulfate, Detergent(General), Ethylene Glycol, Fatty Acids, Ferric Nitrate, Ferric Sulfate, Ferrous Sulfate, Formaldehyde, 40 %, Glycerine (Glycerol), Lactic Acid, Lead Acetate, MagnesiumChloride, Magnesium Nitrate, Magnesium Sulfate, Maleic Acid, Nickel Chloride, Nickel Sulfate, Oleic Acid, Phosphoric Acid, 0-80 %, Potassium Carbonate, Potassium Chloride, Potassium Nitrate, Potassium Sulfate, Soaps (neutral), Sodium Acetate, Sodium Bicarbonate, Sodium Bisulfate, Sodium Bisulfite, Sodium Carbonate, 10%, Sodium Chlorate, Sodium Chloride, Sodium Nitrate, Sodium Silicate, Sodium Sulfate, Stearic Acid, Sulfuric Acid, 0-29 %, Tartaric Acid, Vinegar, Water (Clear), Water (Salt), Zinc Sulfate, Aatrex, Amiben, Ammonium Thiosulfate, Avenge, Banvel, Basagran, Bicep, Bladex, Dual, Eradicane, Extrazine, Larsban, Lasso, URAN Solutions, Modown, N-Serve 24, Phosphoric Acid Solutions, Poly-N, Ranger, Round-up, Sutan, Treflan, Vernam.